This week, The Bottom Line caught up with third year communication major Stephanie Schechter. She talked to us about surfing, being a University of California, Santa Barbara student and watermelons. What got you started into surfing, and why did you continue to do it? I have gone to the beach with my family my entire life, and when I was three, my dad would take me on the nose of his board and hold me up while we rode waves. I caught the surf bug immediately and began competing when I was about eight, entering my first professional longboard contest at age 16. I keep surfing because nothing in the world makes me happier than to ride waves and enjoy the ocean. Surfing has become my life and my passion. I have had so many opportunities and amazing experiences thanks to surfing, and I hope that I can continue surfing forever. Every time I have a bad day or am stressed from school, I take a study break and surf, and all my problems melt away. What does it mean to you to be part of the UCSB Surf Team? Joining the UCSB Surf Team was a goal of mine before even applying to college, so making the team my freshman year felt incredible. The league that we compete in, the National Scholastic Surfing Association, has three divisions in their college circuit: men’s shortboard, women’s shortboard and longboard. 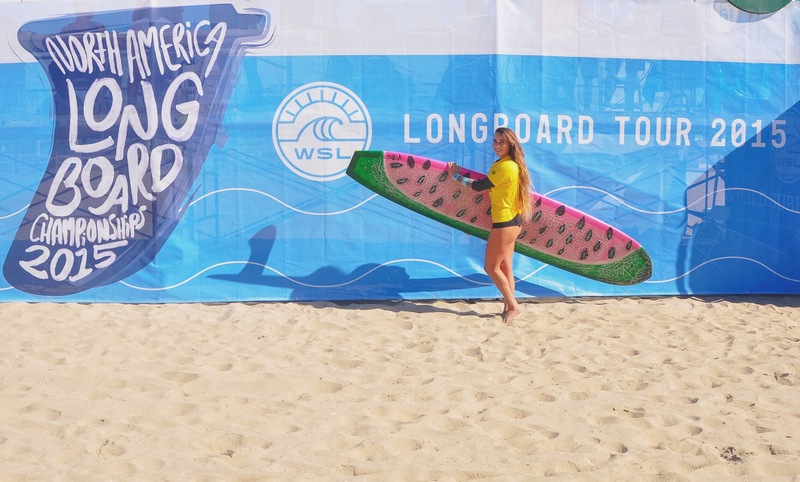 The longboard division is technically co-ed, but the men significantly outnumber the women in the contests, so most schools send men to compete. As a female longboarder, I am very proud to compete for the Gauchos, and I work hard to prove myself against the boys. This year, I am the co-captain of the surf team, along with one of my best friends, Jachin Hamborg, a senior studying abroad this quarter in Chile. It is a huge honor to be leading the team to victory this season, as we are currently ranked the number one college surf team on the west coast! On top of all of the competitive aspects of the team, I truly value the family attitude that we have as teammates. Seeing my teammates on campus, in the water and around Isla Vista always puts a smile on my face. Because I grew up in the surf community, I feel that my surf team is like a home away from home. When you were applying to schools, what made you decide on UCSB? I only applied to schools in coastal California and Hawaii. I knew that I would not want to go anywhere away from the ocean, and my goal was to be at an academically challenging school with a surf team. UCSB had everything I was looking for academically, and with a 14-time national title winning surf team, I knew it was the school for me. I came to visit during spring insight, and as soon as I saw that the dorms were literally on Campus Point, I was sold. What’s your major and career aspirations? I’m a third year communication major, and I’m also a member of the College of Letters & Science Honors Program! I absolutely love the comm. major classes, and they all are applicable to countless career fields. I’m very passionate about creative advertising and multimedia, so I am also planning on applying to the Professional Writing Minor Program this coming fall. A key interest of mine is in the growth of social media and how it has revolutionized new forms of advertisements, and I am hoping that with a communication major and writing minor, I will find a niche within the marketing world. What other interests do you have outside of surfing? When I’m not surfing, I still love to be at the beach as much as possible. I love to swim in the ocean, collect seashells and read on the sand. I also acquired a giant inflatable turtle last summer, so when its flat in IV, I float out to sea and take a nap on my turtle. On another note, I am also one of those people who is willing to cross a busy street just to pat a cute dog. My dog obsession has definitely grown while I have been in college away from my own doggie at home, and some of my friends and I are even members of a “cool dog group” on Facebook. Dog therapy day is one of my favorite days of the quarter, even if it is during dead week!